The next (cold) part- Siberia!! We had sunshine also there, but the other things like -15c and sometimes like a hurricane wind didn’t give the same spirit as in Italy! The food was still quite good here, even if we had been expecting something worse due to our last visit to Russian marks (Ostrov 2009).. The trip from München straight to Khanty-Mansiysk was smooth, we could have been waiting even more, but we didn’t:D arriving around 3am to the hotel and off to bed.. I couldn’t sleep. EH. Time difference to Italy was 4 hours so there were no panic! So what about others. Well, I think you know that our Kaisa did well… more than well!!! the great season so far and now even Worldchampion in pursuit after the silvermedail in sprint! 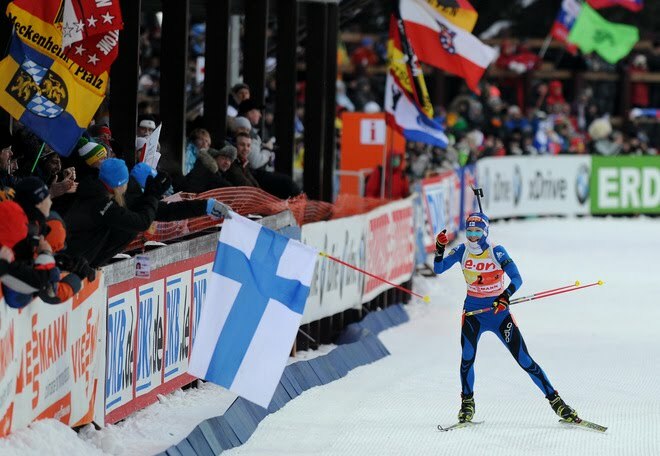 Hopefully the finnish biathlon is getting a boost from this..
For me the first Worldchamps start was then in individual race. On that day we didn’t have very fair conditions. On the morningrun the wind was blowing so hard that moving against wind was nearly impossible!! -15c and… 😀 After Kaisa’s pursuit there were some parties, but I skipped the most fun due to my sickness. Well I felt kind of okey, only my hurting back (SI- thing down in the back was locked) was a big problem! Our massieur tried to push hard to get it okey, but cause it’s not anything to do with the muscles it wasn’t really helping. I got some help from the swiss physio later on the week so that my skiing felt a lot better in relay! !=) Danke Patrick und co!!.)) er fehlt noch ein paar bierlis.. I think without swiss guys these 4 weeks would have been much more miserable.. So when the others started to party after men’s relay (or even earlier) we focused to the relay. Well it was only average from us compared to Antholz, but also the conditions were even trickier! Place 11th and Kaisa’s 0+0 without reservs was good! I for example lost my time on the range taking 2+3 extrabullets next to nervous Sleptsova. shame shame..
And cause the relay was a qualirace (again) Sarkku could stay in Oslo for a few more days..